You’re invited to IEEE Chicago’s 125th anniversary celebration! 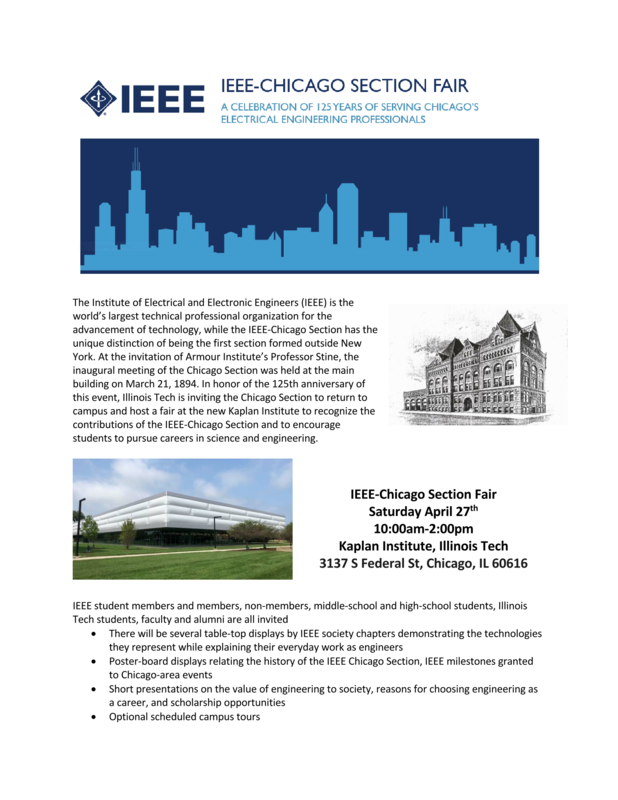 The Chicago Section of the Institute of Electrical and Electronics Engineers (IEEE) is hosting a fair in recognition of the 125th anniversary of its first meeting that was held at the Armour Institute in 1894. Chicago Engineers’ Foundation is a proud sponsor of this student-centered event. Poster-board displays relating the history of the IEEE-Chicago Section and IEEE milestones granted to Chicago-area organizations. See engineering in action in a BMW car! Chicago area Electrical and Computer engineers and technologists – Learn about what the IEEE Chicago Section’s many Society Chapters have to offer. Students – Meet with practicing electrical and computer engineering professionals. Get the answers to your questions regarding an Electrical or Computer engineering career. All – Learn of the history of the Chicago Section and the technological accomplishments of Chicago area organizations. There is no charge, but you must register to guarantee admission. Space is limited.